For us “deadlines” are not a one day event and parcel “transfers” is our business. 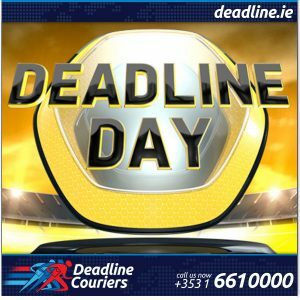 Deadline Couriers strive day after day to provide a top quality Courier and Urgent Direct Courier in Dublin and a fast, secure and economical Ireland and Northern Ireland Nationwide next day parcel and pallet delivery and an International Worldwide express air freight delivery of parcels and heavy and large volume consignments. So if you are keen to score many goals, just make sure you back the right team, the Deadline Couriers team! By Webmaster|2015-10-15T20:48:59+00:00September 1st, 2015|Deadline Services, General, Social|Comments Off on Deadline Day!